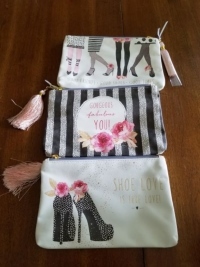 These cute little bags are 9"W x 5"H with a zipper closure and tassel. Choose from Shoe Love is True Love, Gorgeous Fabulous You, or Good Friends:Good Shoes:Good times. For the shoe lover or anyone else. Great for make up or jewelry or anything you can think of.